Experience the "WOW" Difference When Purchasing Your Next Vehicle! Laugh & Watch the Woody’s Weekly Update! 2012 Jeep Wrangler Unlimited Sahara 4×4 3.6L V6 Uconnect 130 CD/MP3, Tow Package, 17 Moto Metal Black Alloy Wheels, Grille Guard, Remote Start, Running Boards, Tow Hooks, Hill Start Assist, Infinity Sound System, 115V Power Outlet, Hard Top, Certified Warranty. Grins come standard. For a good time, drive. If you want an amazing deal on an amazing SUV that will keep you smiling all day, then take a look at this fun 2012 Jeep Wrangler. This Wrangler is created for a spirited individual who is always looking for a great time. Woody’s Automotive Group is an Honest, Up-Front, One Price Dealership selling used cars near Kansas City in Chillicothe, MO. Check out what over 1000 customers are saying at wowwoodys.com. With the largest, most diverse inventory in Middle America you can view all makes in one location! We have over 700 vehicles with Over 80 different car models, 60 Different SUV Models, 20 Different Truck Models! Check out our website to see many more pictures, videos, and more! We will pick you up at the airport or ship your vehicle to you! If you’d like more information about this luxurious used Jeep Wrangler our huge selection of other used Jeep or 700+ vehicles located near Kansas City please visit our website and provide us with your contact information. One of our empowered Woody’s Automotive Group Sales Advisors will contact you promptly. For immediate assistance contact us toll free today at (888) 658-3616. Our award winning Finance Management Team works with over 15 local and national banks to get you the best rate and term. When it comes to Price, we’re third party verified among the lowest in the nation! This vehicle is certified with a Pre-Owned Warranty at no cost to you! Not sure which vehicle you want? With the largest, most diverse inventory in Middle America you can view all makes in one location! The majority of our vehicles qualify for Woody’s Assurance Program that includes a 12 Month Return Policy, Limitations Apply, see dealer for details. Check out our easy car payment calculator to view any interest/payment configuration. If you would like to save time just visit our secure online credit application here. For Directions to our dealership from Kansas City, Columbia, Omaha, Austin, St. Louis, Tulsa, Minneapolis, Topeka, Wichita, Des Moines or Olathe just go here. 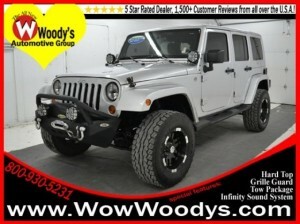 Come and see why so many car, truck, suv shoppers come from all over the U.S.A. to buy their vehicles at wowwoodys.com and read over 1,000 customer reviews on our website today. Also, watch video customer testimonials from our Wowed customers from all over the country! Monday – Saturday: 8:00 am – 6:00 pm or whenever the last customer leaves.